Bitcoin’s market cap has gone down to around $216 billion today after reaching an all-time high of some $320 billion a few days ago. With trading volumes down to around $12 billion today, halved from its previous high of around $23 billion in a 24 hour period. The digital asset turned downwards exactly one week ago when bitcoin futures launched at the world’s biggest exchange, CME. Since then, price has nearly halved at the time of writing, down from an all-time high of $20,000 to a current price of around $12,000. Market action has been very volatile recently, with $1,000 movements common in the past few days as a sell-off seemingly continues. After a low of $10,700, a bounce sent price to almost $15,000, but that might have been a bull-trap as price turned downwards again today, briefly falling just below $12,000. 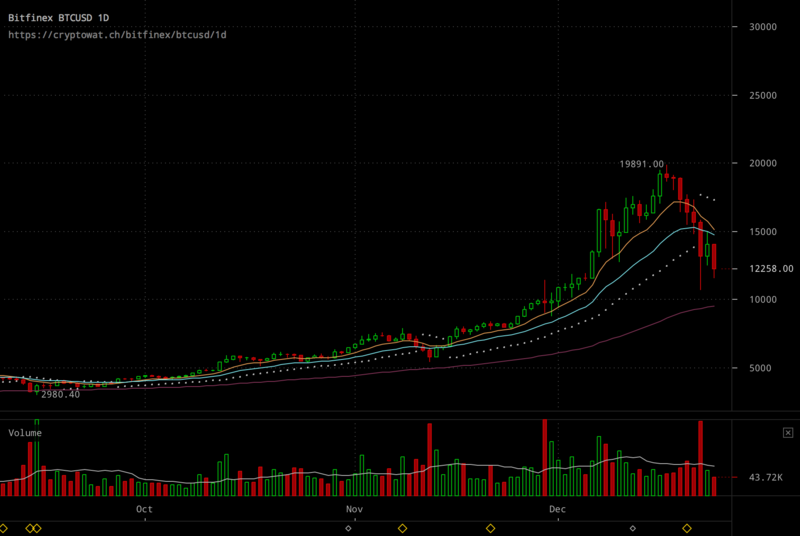 Whether that big support line will hold remains unclear, with the market potentially testing again $10,000. If that falls, then $8,600 might be a big test. Alternatively, there could be another leg up to see if that $15,000 can be broken, but much might depend on whether sentiment has changed, at least in the short term. Something which could be the case due to a lower level of interest because of the festivities, with Christmas arriving later today. While much else is closed in anticipation of it, including bitcoin futures, the price action remains open, with all prominent exchanges continuing to function, so traders might continue trading. But activity, as shown by trading volumes, is decreasing, with many likely opting for a peaceful and enjoyable Christmas with their families. Although even there they might not quite escape bitcoin, an asset that has now gone mainstream and might occupy some of the dinner table discussions, especially following, what might be for many, far too much drink, and even more stuffing.